Death Metal Underground: Bruce Dickinson Embarks On Tour for Book – What Does This Button DO? 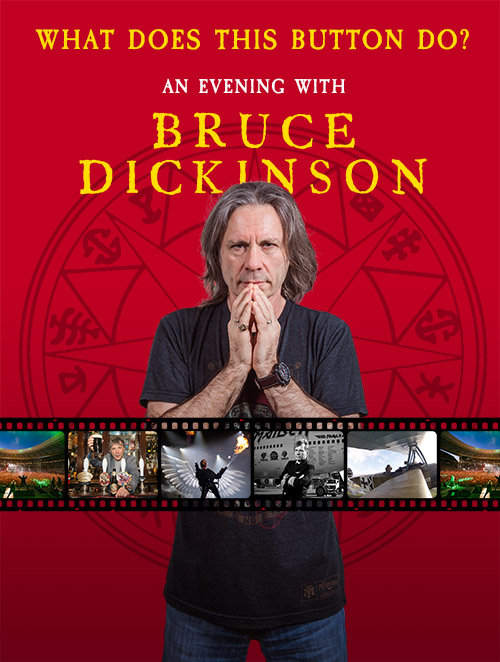 A true renaissance man, Bruce Dickinson has made movies, written books, toured the world, made great music and triumphed over everything while giving all of his blood and sweat on the stage. An artist who became huge with almost none airplay, only through effort and exhausting tours, often to destinations deemed dangerous by most artists. From the above clip we can see that his voice is still in top shape. He might be missing some of his range and sharpness of its high ends, yet his lows have grown deeper, more emotional and powerful. Truly, his voice has matured like old wine. The fact that he has been singing lyrics influenced by William Blake and Aleister Crowley is only a small tribute to metal’s roots in romantic-esoteric Nietzschean mythology. His actions and adventurous life are a proof of what it means to be true. Now, that’s metal. UP THE IRONS. To be pedantic, it’s not exactly a “new” book as it was released back in 2017. It is certainly a good read though that would be interesting for any Maiden fan. Great video. What a powerful voice. Will be interesting to see how his new solo album turns out as it is probably one of the most expected albums on my list at the moment. The three latest albums on his solo career are all good, though only Chemical Wedding comes close to perfection and which I consider Bruce’s best work to date. Thematically and in consistency it easily surpasses most of Iron Maidens material but this is in no way to say that Iron Maiden were bad at any moment in their classical era.